The Zourman Drums hi-hat conversion module replaces a standard 2box hi-hat (hall effect sensor-based) with your favorite ATV ad-h14 hi-hat. The solution is 100% plug and play (only 2Box hi-hat calibration needed) and it handles both a ATV hi-hat pad (bow/edge) and the active optical based hi-hat pedal control through the two input connectors. 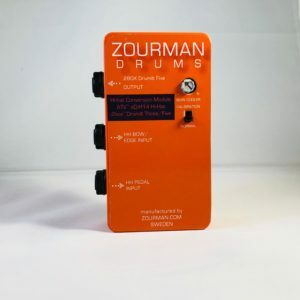 The Zourman electronics and intelligence combine the three trigger signals and deliver the output into a standard 2Box hi-hat input for both DrumIt Three and Five (single stereo jack). Note: The ATV aD-H14 will not work on 2box DrumIt Three directly through the built in support for Roland hi-hats. (ATV normally emulates Roland VH-13) The reason for this is that the active optical hi-hat control sends out different voltage levels between open/closed pedal instead of resistance. This fools the hi-hat input on 2box DrumIt Three. DrumIt Five can only handle 2box hi-hats natively – so a Zourman Drums hi-hat conversion for aD-H14 is required. The Zourman Drums ATV aD-H14 hi-hat conversation module for 2box will solve this for both Drumit Five & Three. The solution is the result of extensive research, development and rigorous testing with a range of equipment. Our testing has found that ATV hi-hats are very similar to 2Box hi-hat response, but more reliable and slightly faster. To further enhance the playability and response, the bow sensor (piezo) may need to be “cooled down” slightly with a variable resistor – an additional feature built into the Zourman hi-hat conversion kit. This model only supports ATV aD-H14! All about the installation/calibration, knowledge and more!